The Cat's paw hitch is similar, but with the standing parts broght two or more times through the bight. Will fail unless equal tension is applied to both of the standing parts of the rope. The cow hitch is a knot (specifically, a hitch). The cow hitch comprises two half-hitches tied in opposing directions. Form a bight and pass it through the ring from the underneath. Pull the head of the bight downwards, and reach through it, grabbing both standing parts of the rope. 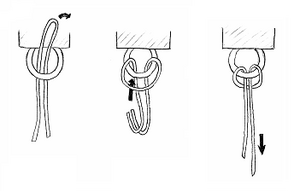 Pull both standing parts of the rope through the bight. The cow hitch is often used to connect loop-ended lanyards to handheld electronic equipment, since it can be tied without access to the ends of the fastening loop. This page was last edited on 3 June 2013, at 23:08.